MBAs were born from the need to help business professionals prepare for senior management as they climbed the corporate ladder. They were, in essence, degree programmes designed to help the professional evolve their skills, as their careers evolved simultaneously. But as the MBA focused on giving students the business relevance they required to stand out, it to needed to remain relevant. In recent years the traditional MBA has had to transform to meet the changing needs of working professionals. Enter the alternative MBA programme. These new generation MBAs take a number of forms, from online MBAs to on-campus short courses, but their common thread is their ability to meet the demands of the working professional. A professional who could benefit from MBA skills, but can’t necessarily overcome the barriers to entry of the traditional MBA. This natural marriage of lifelong learning and MBAs has been picked up by a number of world-leading universities, as well as industry thought leaders like Seth Godin. One such example is the London School of Economics and Political Science (LSE) MBA Essentials online certificate course. This short, online, MBA-based programme aims to provide you with an essential MBA toolkit that focuses on the leadership skills, financial necessities and human interaction vital to the growth of the contemporary business professional. It’s no longer a question of credibility, but rather of professional preference, but what are the benefits of an online MBA alternative? 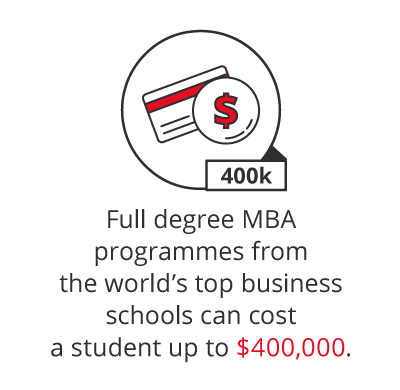 Traditional, full degree MBA programmes from the world’s top business schools can cost a student up to $400,000 when you consider tuition fees, the opportunity cost of lost income and living costs. This number is inconceivable to a huge portion of professionals who would benefit greatly from MBA knowledge and skills. Coupled with this is the massive time commitment. A traditional MBA can take anywhere from one to three years to complete, a sacrifice that many business professionals aren’t willing or able to make. 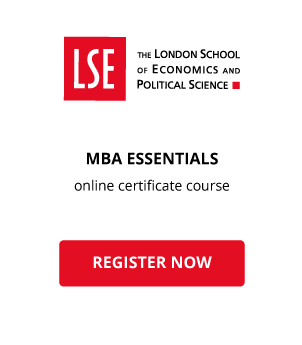 The LSE MBA Essentials course provides you with the MBA skills you need to achieve excellence, but at a fraction of the cost and commitment of a traditional programme. This gives you the opportunity to implement learnings into your career in real-time. It also means you’re able to continually keep your skill set relevant by supplementing your continuous education with other online courses or programmes – more specific to your role or industry. This is particularly beneficial when you consider that your learning doesn’t need to be limited to one discipline. Focusing on online courses, you have the ability to expand your skill set in multiple directions, learning everything from MBA skills to user experience design and digital marketing. And if you’re not sure whether an MBA is the right decision for you, these alternative MBA programmes afford you the opportunity to test the waters and prepare for a potential full MBA in the future. The LSE MBA Essentials online certificate course gives you the opportunity to learn from industry experts and esteemed University faculty. The London School of Economics and Political Science developed this alternative online MBA programme as a way of bringing its world-class teaching and knowledge to the working professional. The course content seeks to only provide the most relevant and up-to-date knowledge and skills to students, helping them expand their own careers and influence the contemporary business environment. On successful completion of the course, you’ll earn a certificate from the London School of Economics and Political Science – hard proof of your ability to lead in business, backed by the names of a world-leading university. A major drawcard of the traditional MBA is the networking opportunity. You have the guarantee that your classmates are as interested in developing their careers as you are, and there’s the potential that some of you may go on to exercise serious influence in the business world in the future. A concern for most online courses is that learning online is often equated with learning alone. That isn’t the case with the MBA-based course from LSE. The GetSmarter learning model makes for collaborative efforts where group assignments and discussions are at the centre of the learning experience. You’ll be exposed to a multitude of different professionals, at different stages of their careers, all striving for excellence. An additional benefit of this kind of networking experience? Your network is global. Online learning means your classmates aren’t limited by geographical constraints. You have the opportunity to learn from, and partner with, business leaders from all over the world, who bring their own context and unique experience. The LSE MBA-based course is also characterised by a human-centric, supported learning model – something unique to the vast majority of online courses. You’ll be supported every step of the way by your expert teachers and dedicated Success Manager, much like if you were on a physical campus. Want to explore the opportunities of an online MBA alternative?